On Friday I participated in a study at Penn State's Meat Science Lab as a sensory panelist tasting different varieties of lamb loin. As some people don't like any pink in their meat, or anything that looks bloody, the survey mentioned that the participants should be OK with consuming lamb cooked medium-rare. It went on to say "The lamb may appear to be rare to medium-well." That made sense to me, as a roasted lamb loin will be more cooked on the ends and more rare on the center. Unfortunately, of seven samples of lamb, I only had one that could just just just barely pass as medium-well. The rest were definitely medium-well and two were totally in the well category. I'm fine to express my opinion on meat cooked to the far end of "well", but when one of the questions is about the juiciness of the lamb...its hard to have an opinion when the lamb is cooked to jerky-status. Coming off a rather disappointing lamb panel, but with a hard earned $25 in my pocket from PSU, I decided to go the opposite route: lamb tartare. Michael Solomonov has a wonderful recipe for lamb tartare using lamb loin, tart apple, toasted walnuts, local egg, and the dark, raisiny flavor of urfa bibier chiles. 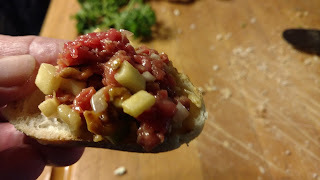 It's a fascinating tartare recipe, as I normally think of walnuts and apple as partners for pork. But the tart apple cuts the gentle gaminess of the lamb, while the toasted walnut is wonderful with the savory taste of lamb meat. 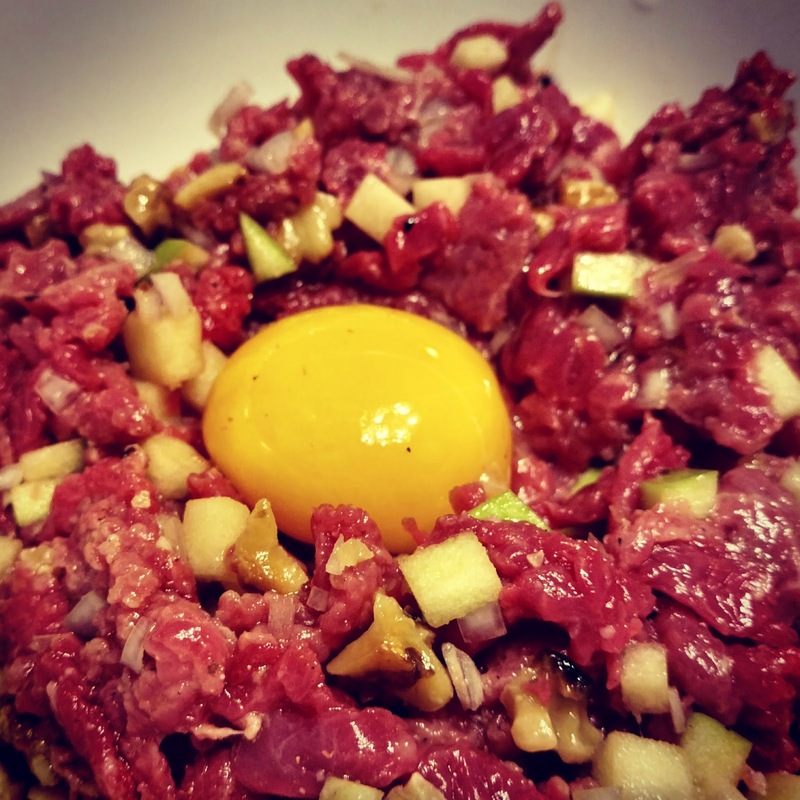 The tartare classics of raw egg, brunoise shallot, and freshly ground pepper rounded out the dish.